Along with his title, Julian Andreas Cynan Evan St. David, twelfth Duke of Haverford, inherited a library of more than 30,000 books, a load of debt incurred by his immediate predecessors (much of it in increasing the library), and responsibility for the Haverford tenants and his younger siblings, Lady Glenys, who “should have chosen a husband five years ago,” and Griffin, who is learning disabled but possesses a wisdom of his own. Considering the state of his finances, Julian believes he will be ready to look for a duchess in “approximately eight years and seven months.” His sister Glenys disagrees. She has planned a house party that will include suitable candidates for the position of Julian’s wife. Julian, although worried about the costs of the house party, goes along with it, making sure that the guest list also includes gentlemen who might persuade Glenys that her own marriage is a desirable outcome. If his closest friend, the Marquess of Radnor, stops pining for Glenys and finds a wife among the guests, that too will please Julian. Elizabeth Windham, with a decade of seasons and a failed abduction behind her, thinks spinsterhood might suit her quite well. However, her family, eager to avoid scandal, is bent on seeing her married soon. It is at their insistence that Elizabeth and her sister Charlotte, the oldest and only remaining unmarried daughters of Anthony Windham (younger brother of the Duke of Moreland), are attending the St. David house party. Upon their arrival at Haverford House, Elizabeth, who is passionate about books and has found a cause in lending libraries, is more interested in reading Childe Harold than in meeting eligible gentlemen. Charlotte, vilely ill, is more interested in peppermint tea than in books or gentlemen. Despite her disinterest in marriage, Elizabeth is impressed by the duke—and by his library. The duke is impressed by Elizabeth’s red-haired beauty and independent spirit. Once the two of them confess to each other their lack of interest in marriage, the way is open for friendship to develop. But the intimacies of friendship lead to other intimacies, and soon the pair is deeply in love and can think of nothing that would please them more than to be married. Unfortunately, the path to wedded bliss is strewn with obstacles—Julian’s finances, the expectations of Elizabeth’s family, and a vengeful villain who has the power to destroy the legacy Julian has spent his life protecting. 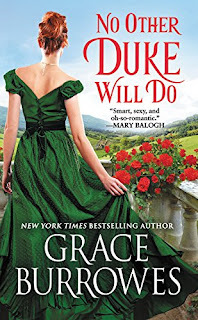 No Other Duke Will Do is the third book in Burrowes’s Windham Brides quartet, and in it this prolific author is at her best. Julian and Elizabeth are an immensely likable pair who see each other with clarity and fall in love with what they see. She admires his loyalty and sense of honor and accepts his stubborn pride. He admires her warmth and intelligence and accepts her managing ways. One of the things I appreciate most in Burrowes is her ability to show multiple dimensions to the relationship of her heroes and heroines. Julian and Elizabeth certainly have a healthy lust for one another and share all the sentiments appropriate to lovers, but they also genuinely like one another and enjoy each other’s company. The secondary characters are appealing as well. Griffin is an especially endearing character with a child’s openness and simplicity. Burrowes’s skillful characterization of him evokes the reader’s sympathy but avoids pity. One cannot pity a character so filled with light and love. Glenys, Charlotte, Radnor, Elizabeth’s Aunt Arabella—all are wonderful characters. Even the villain Sherbourne is a “teachable villain” poised for reform. Also, this is a novel that offers not one but five romances. One of the secondary romances, that of Charlotte Windham and Lucas Sherbourne, is in early, tentative stages in this book, but they will be the H/H of A Rogue of Her Own, book four in the series, scheduled to be released March 6, 2018. If you like character-driven historical romance that pulls you into a well-developed world and offers a reading experience that is great fun, I highly recommend this book. It can be read as a standalone, although readers who have enjoyed the other Windham Brides books or the first Windham series will find it a special delight. Grace Burrowes is an autobuy for me. I have absolutely loved every one of the books of hers that I've read. Lucky for me she's written quite a few and I've been collecting them as I can. Thanks for this review. What a lovely review. I love Grace's books, and I've been waiting for this one to come out. A lovely early Christmas gift, Diane! Hope you enjoy it, Amy! I thank you for the review. You have made each of the characters people I would like as friends. That is what I like in a book I read. Thanks again. I felt the same while reading this review, Annette. Thanks for the well written review, I just won a copy of this from Goodreads, so I definitely look forward to reading it!! Thanks for the great review, Janga! I have this book & the others in the series & plan to read them in order shortly. Love the beautiful covers, too! You have some good reading ahead, Sharlene! She's also a very lovely person. Hope you enjoy the book! Thank you for an informative review. I've heard wonderful things about Ms. Burrows books and this sounds like one I would like to read. Thanks for stopping by, Eileen!